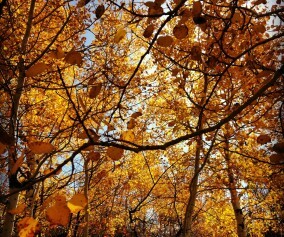 As I sat at my desk to finally write on my blog, it’s been since late September from my last entry, I could not stop thinking of one theme that sums up last fall…FIBBER. Like a 5 year old tearing a small piece of wrapper on their present under the Christmas tree and denying it…. So became my Pointers beeper as that sound echoed a possible fib. As any decent Uplander, we pride ourselves on our dogs. We all do, but us Grousers take it to the next level. 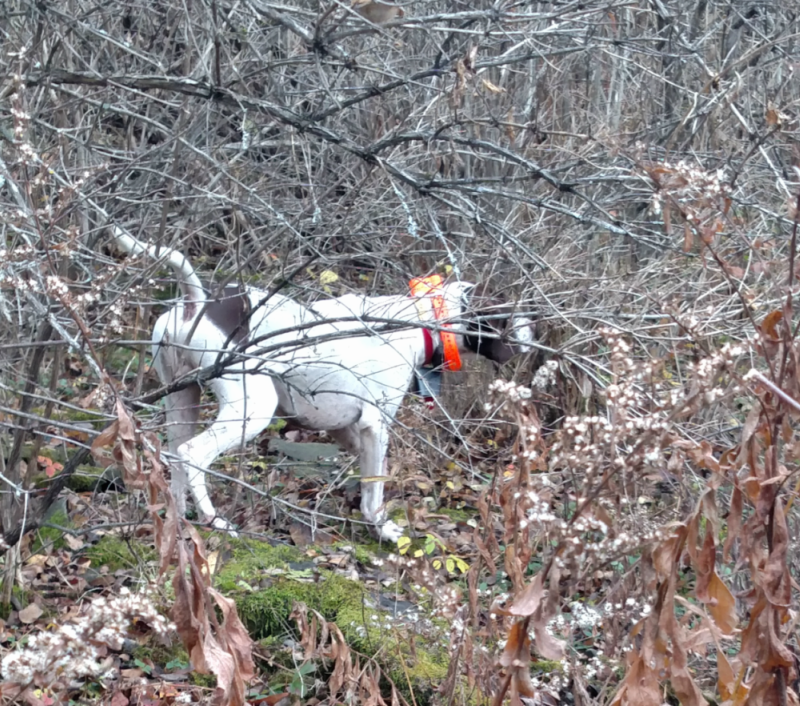 The nature of the Ruffed Grouse dictates that we have a dog or dogs that are able to scent a bird from afar and freeze at that moment without crowding or getting in too close. Yes this may be the case for every bird, but especially the weary Grouse who bursts and fly’s at the speed of sound. The only issue was he would freeze over and over at what seemed to be nothing most of the time. There is only so many times you can say “it must have been hot scent” or “that bird must have just been there” before you have a mutiny on your hand with the buddies you are hunting with. It was so frequent that even when he was on a bird, you were likely to not rush over to him as he was probably “false pointing” or “a fibber” in your mind. I was frustrated, other people I was hunting with frustrated and biting their tongues. I had to know why. The exact reason for this was not pinpointed and was told…. 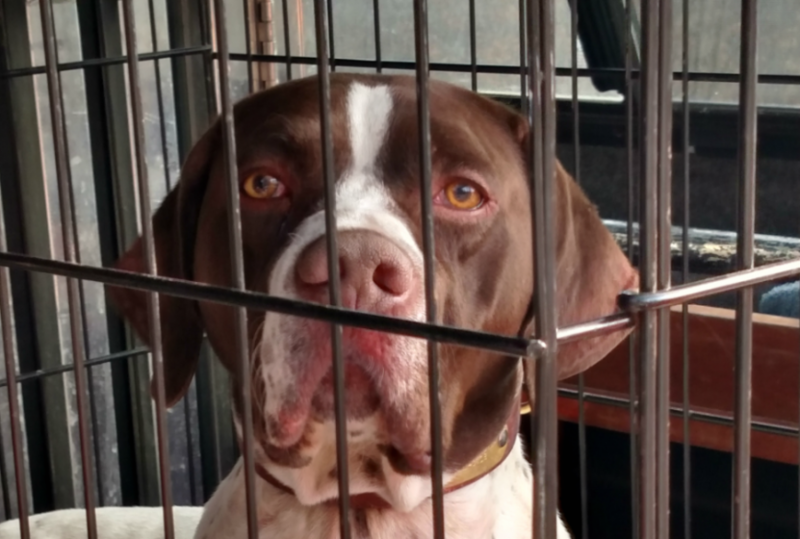 “THERE IS NOTHING WRONG WITH THAT DOG….LET HIM SORT IT OUT ON HIS OWN AND HE WILL BE FINE”. I can only imagine that one bird flushed in front of him possibly as he creeped towards the bird and busted off his nose causing him to be so cautious to point at any scent. 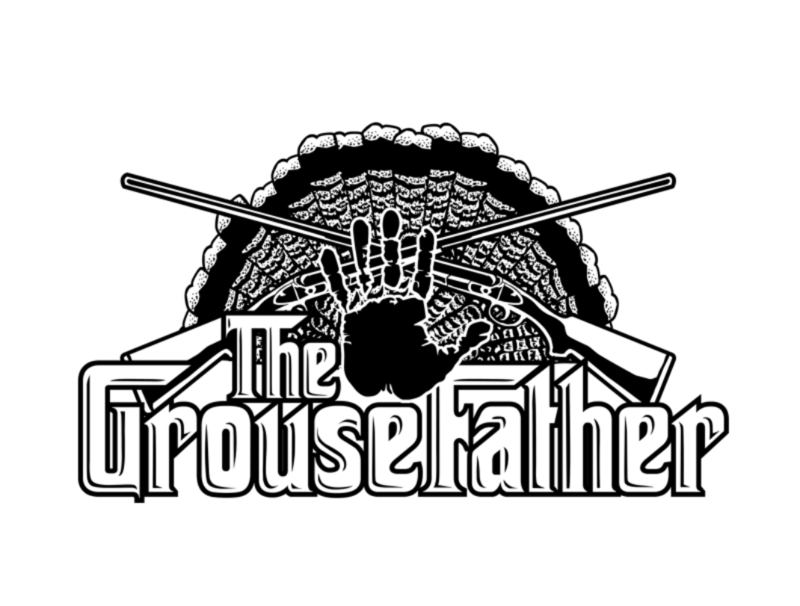 I spent the majority of October Grouse and Woodcock season on and off birds with fatso and his Fibbing ways at that time. The birds he was on, when he was on….were outstanding points and dog work. There was a Grouse Point that he was on for at least 4 minutes and I mean that. Cut small patches in multi flora and alder saplings in 15’ x 15’ patches. I slowly walked up and across from him and stood there. I was told not to say a word or encourage the dog if he was false pointing and simply let him break or move in when he was ready or acknowledges that there was not a bird there. I let him keep his point for a bit as I watched his intense eyes watching the cover in front of him. I took pictures, looked around and even took a few steps to the sides of me and nothing. He did not move an inch as he stayed there watching. After a minute of this and definitely over 3 mins as I had looked at my watch…I moved in closer and stepped into the small thicket. OUT CAME A HUGE BIRD! My brain and body in shock, I didn’t raise the gun at all. 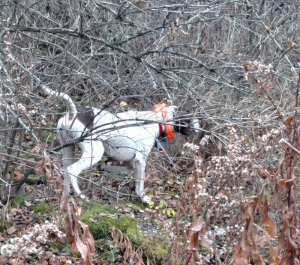 This was the ignition in him as we moved down to the bottom where we find many woodcock and he sprung ahead of me and somehow flushed a woodcock that I had no shot at. I marked the bird as it landed on the edge of the orchard where we had started hunting earlier. I brought him closer with the wind to his nose and quickly started cracking his tail high as he slammed on point. Stretched out and intent on getting to the bird he remained frozen as even his tail was held down by a low hanging branch. I knew this was a bird and was so proud that he was getting back to honest points. I stepped in to flush the bird and off it went and down it went. It was synchronicity at its finest. That was the end of the first half of the season as I had finished my last Sunday of small game season alone in those hills. 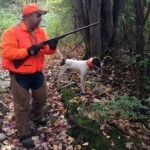 Deer season was to start that following weekend in central New York and I was going to start hunting Pheasant on Long Island as it was a great way to run the dog during that down time when Deer hunting blocked any chance of getting to Grouse in the rest of the state. By no means can these birds be compared to Grouse in any way, shape or form…but, there was a great deal of logic to this dog getting on these birds. Historically, the eastern end of Long island was a Haven for Pheasant, Quail, Rabbit, Woodcock and yes, even Ruffed Grouse. Encroachment and less than standard efforts by the NYSDEC have led to the demise of Ruffed Grouse Populations and Quail. 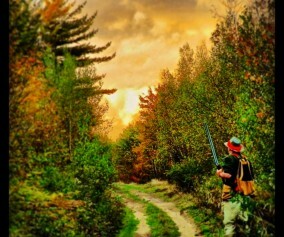 Flights of woodcock still migrate through and the annual stocking of Pheasant in the Co-ops allow for great hunting on these vast open parcels. Predation and consistent flow of bird hunters keep these birds moving and liberated in a very short period of time. It was amazing to see how wild these birds seem and yes, very hard to hunt. 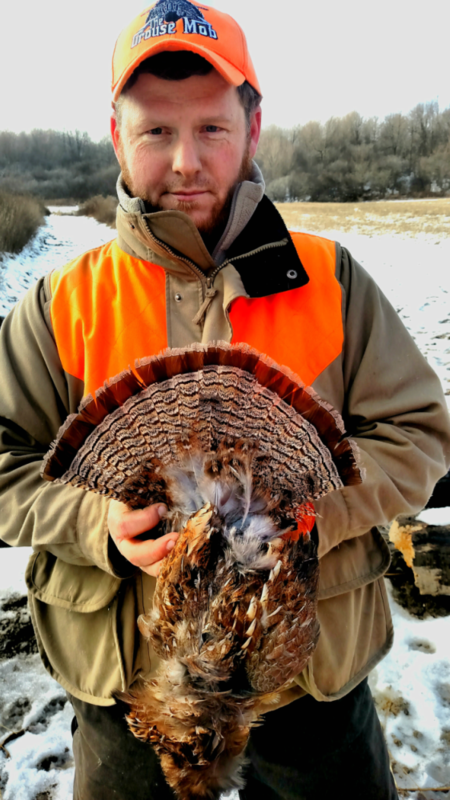 Heading into this experience I knew that Pheasant run as I’ve hunted them all over the country. I was surprised at how healthy and wild like these birds were and this type of bird may be just what one would need to make a Fibbing Pointer into an Honest Pointer. My thought was that a good pointer would have to make game, get ahead of the bird and pin that bird down. With a Grouse, this is not always the case as a Ruffed Grouse flee mechanism is flight rather than Run more often. So I made plans to meet up with friend Brad Trotta who was very versed with the Co-op and the program out there. As a snobby Grouser, I am used to dismissing some pen raised birds as bad flyers, not a challenge, etc… I got a rude awakening when we got to the first field. We ran Brads dog Jerry, a liver and white Britt and my Pointer Fatso in this massive field which had many breaks and hedge rows. It was massive and right out of the truck in the middle of the first field Jerry locked up and Brad took a huge bird. This was a great sign as the cool air finally came in and we seemed to feel more bird weather coming in. 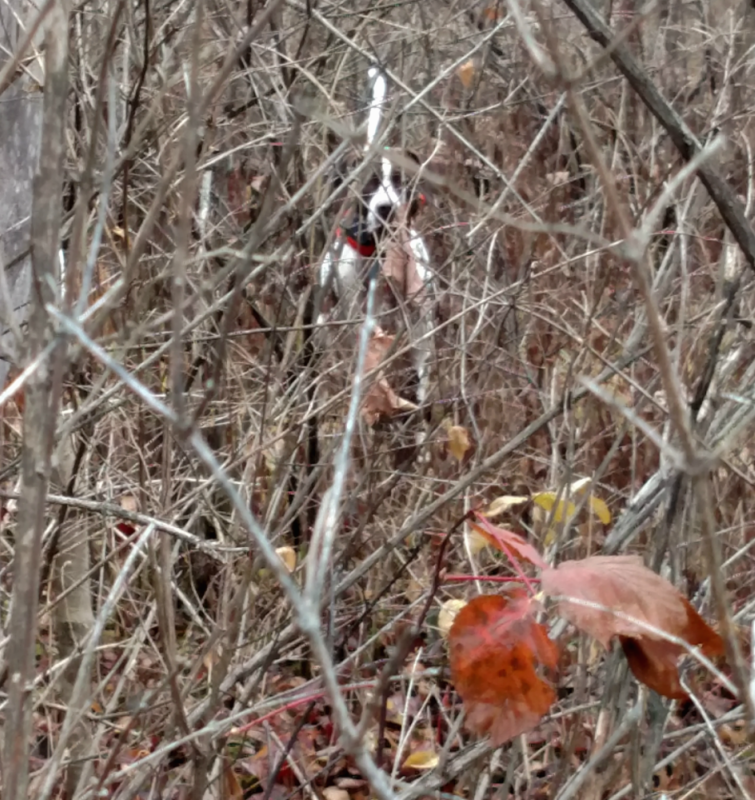 We made our way to a connecting field with a nice timber stand in the corner and heard the beeping of Fatso’s collar. Low and behold he was on a very proud and staunch point as we closed the distance to him. We moved closer and our proximity flushed the bird and I took it. There was a decrease in false points and now motivation to pin the bird rather than point only. 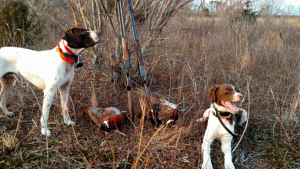 We continued to hunt the short season locally here on the island and Fatso continued to lessen his Fibbing Points as he gained confidence in his ability again. 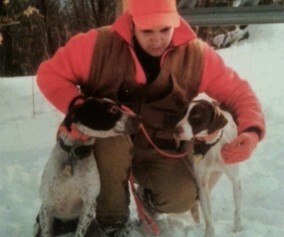 We continued to bite our nails as no major snow dropped in upstate New York which always inhibited us to get back up there as the snow usually is too high and hard crusted making Grouse hunting impossible. That major snow never came. The holidays passed and all systems a go for getting up there to chase some birds. I was eager as I knew He would fib less. I brought Brad and Jerry up and we got together with Sam Glasbergen and Leon Eaton to hunt a couple of covers that first weekend after New Year’s. Leon had a spot that I had never been to and we managed to get up that hill and Jerry and Brad/Sam had a first point ahead of us which somehow got away from Brad. We worked across this old patch and all the way at the top was Leon and Brad with both dogs. Fatso went on Point with both front feet on a log facing Leon and Leon looked beneath the dog and log and there was a Male Grouse with his chest out facing Leon as well. “I wish I had a camera…that was a million dollar picture” said the proud owner of a beautiful Chocolate banded bird shot over the Fibber! Fatso went on to point a few more birds over the next couple of trips we made to those covers. A few points here and there at spots we know birds flushed out of. The numbers of Fibbed points are coming around less and less. I received criticism for a dog who was a Fibber. I saw hunters not rush to his points when in fact birds flushed ahead of him. “The pointing all the time was starting to annoy me” said the judge. I also said all of that so I cannot throw the stones. I have had bird dogs for 33 years and have hunted birds for longer than that and I’ll take this Fibber and everything he has given me any day. He is imperfectly perfect and has made me honest. Great read! 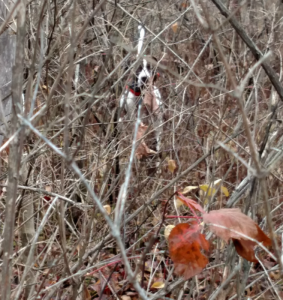 I used to get frustrated with unproductive points, but as I paid attention to the context of these situations I learned over time with my pup, more often than not they were running grouse (and woodcock!). I’ll take an overly sensitive dog any day – you can’t unflush a bird. Articles like this make the off season easier to take, thanks for the write up! Thanks Aaron… I began to realize he had a stronger nose as time went on. 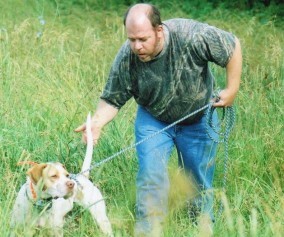 You also get impatient as some of the company I was hunting with was new and impatient. Fatso matured the 2nd half and used that caution for the better. Now that seasons over….I’m writing more. I’m reading more as well…makes the down time go by!